The two small, inset images show actual observations of the most ancient spiral galaxy ever observed. The rest of the image is an artist's illustration showing how a massive galaxy cluster bends and magnifies the light from the distant galaxy, making it visible to astronomers on Earth. Astronomers have uncovered an ancient cosmic artifact 11 billion light-years from Earth: the oldest spiral galaxy ever seen. The newly discovered galaxy, known as A1689B11, is an ancestor of modern spiral galaxies like our own Milky Way, which are defined by long tentacles of gas, dust and stars that wrap around the galaxy's central bulge. "Spiral galaxies are exceptionally rare in the early universe, and this discovery opens the door to investigating how galaxies transition from highly chaotic, turbulent discs to tranquil, thin discs like those of our own Milky Way galaxy," Renyue Cen, a co-author of the new paper describing the findings and a senior research astronomer at Princeton University, said in a statement. Galaxies come in many different shapes and sizes, and researchers think many spiral galaxies form mainly through mergers of smaller elliptical galaxies, although many factors can affect how a galaxy changes its shape over time, according to NASA. Elliptical galaxies are disks that can be mostly circular or very elongated but lack the arm-like features of spiral galaxies. Astronomer Edwin Hubble was one of the first people to theorize that elliptical galaxies evolved to form spiral galaxies, although he did not fully appreciate the complexity of galaxy evolution, according to the European Space Agency's Hubble Space Telescope website. Nonetheless, researchers still refer to the time in cosmic history when spiral galaxies began to form from elliptical galaxies as "the Hubble sequence." "Studying ancient spirals like A1689B11 is a key to unlocking the mystery of how and when the Hubble sequence emerges," Cen said in the statement from Swinburne University in Australia (where some of the other co-authors are based). 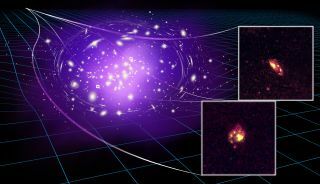 Previously, researchers reported finding spiral galaxies that date back 10.7 billion years. The newly discovered galaxy is too far away to be observed directly with modern instruments. So the researchers took advantage of a natural phenomenon known as gravitational lensing, in which the gravity of a massive object (like a galaxy or a cluster of galaxies) bends and amplifies the light from an object that lies beyond it (as seen by an observer). In this way, the authors of the new research paper were able to detect light from the very distant spiral galaxy A1689B11 by looking for the effects of gravitational lensing around the edge of a galaxy cluster that is nearer to Earth. The observations were conducted using an instrument called the Near-infrared Integral Field Spectrograph on the Gemini North telescope, located on Mauna Kea in Hawaii. The researchers were able to "look 11 billion years back in time and directly witness the formation of the first, primitive spiral arms of a galaxy," Cen said in the statement. Because light travels at a finite speed, the light from A1689B11 left that galaxy 11 billion years ago, when the universe was less than 3 billion years old. In this way, astronomers can look back in time and learn about the history of the universe through direct observations.